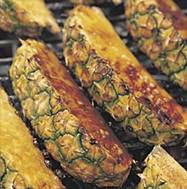 The sight of grilled pineapple with a caramelized glaze makes me think of summer, no matter what time of year it is. But sugary fruits make a right mess of the barbecue hot plate (griddle). Fortunately, the mess is easily removed with water. Squirt plenty of water on the plate while it is still hot, scrape it clean, wipe with an old towel and it’ll be just like new. Put brown sugar on a large plate and turn skewers in it to coat. Cook over medium heat on a barbecue hot plate (cast-iron griddle) until lightly browned (the hot plate should be clean but not oiled – the juice will soon run out of the pineapple as it heats). Transfer to a plate and serve with ice cream. Alternatively, cut the pineapple into eighths, coat in sugar, then cook on a barbecue hot plate. During the early part of the year, a journey around the garden leaves us looking at the remains of last years outdoor cooking activities. Often, our grills are left outside in the elements, uncovered, and in many cases have seen far better days. It is this time of year that we start to think about cooking our favourite barbecue food outside during the warmer months with our friends and family, but before we are ready to start throwing charcoal and fire-lighters onto the barbecue, it is time to turn our attention to cleaning our cooking hardware in order to get things off to a hygienic start. A stiff wire brush is a huge help in cleaning your grill. Simply give your rack a thorough scrubbing before and after each use. If you have used oil to coat your rack, getting the grill clean should be easy with a brush alone. Brass-bristle brushes are especially good for cleaning porcelain-coated grills since they won’t damage the porcelain. Grill stones are specially designed to help get grease and stuck-on food off of your grill. They look similar to a large pumice stone with a handle to help make scrubbing easier and is also an excellent heat convector like volcanic rock, ceramic tiles etc. The main difference with a grill stone is that it has no holes, and because of this feature, it greatly reduces the chance of flare-ups and poor cooking. Grill stones are capable of withstanding incredible heat, up to 2000 degrees Fahrenheit. Grill stones are ideal for use on most shapes and sizes of grill as the stones design allows it to work with almost any grill format. This is one of the most common methods of cleaning BBQ grills/grates. All you have to do is leave your barbecue on after cooking once all your food has been removed. Once you have done this for around quarter of an hour, allow the grill to cool down for around 5 minutes and then use an old trowel, or flat piece of metal and gently scrape both sides of the grill to remove the sticky hard residue. Please be aware that ceramic grills can get damaged very easily if too much force is applied with sharp objects, so be careful with your choice of tools. If you have an old metal kitchen utensil, such as an egg-flipper, these are ideal tools to make the job safer and easier. However, you should be careful that this method is not prohibited by the grill manufacturer in order that you don’t accidentally void your warranty. Please ensure your own safety if you use this method by wearing a suitable pair of cooking mitts, or specialised heat resistant gloves. If all else fails, letting your grill racks soak in warm water will help loosen stubborn dirt and food remnants. This can be good for getting the edges of your racks, which are often difficult to scrub properly, really clean. A good way to reduce the pain of cleaning a barbecue is to prevent the worst of the residue from sticking to the grill in the first place. To do this, coat your rack with a layer of oil before you start to cook. This will help you to keep your food from burning and sticking to the grill and will also make cleaning the grill afterwards much easier. Remember to only spray oil onto a cold grill. Spraying onto a fire or hot grill will cause the oil to flare up and could cause serious injury. If you use your barbecue on several occasions throughout the year why not invest in a steam cleaner? This will speed up the time taken to clean your barbecue after use and can be very effective indeed; therefore if you are fed up with scrubbing to remove the BBQ residue, an investment in a steam cleaner can be very useful and time saving. When you having finished cooking your food, soak an old newspaper in water and place it on top of your warmed grill with the lid firmly shut. After about three quarters of an hour, open the lid and wipe off the residue. Don’t let the newspaper sit on the grill rack for too long, as it will dry out and create even more work for you. The number one way to help keep your barbecue clean is to simply purchase, or make, a cover to place on your unit while it is not in use. In order to give your barbecue some protection from the elements it’s a good idea to cover it with a plastic sheet, or preferably a manufacturers cover that is specifically designed to do the job properly as they generally have a tighter fit and are more effective. During the winter months you may also remove the grill and store it in a dry place away from the damp and the elements. This will decrease the speed at which the rust forms, and you will benefit the most by doing this in conjunction with the oiling method mentioned above. This helps to inhibit rust during the months when your barbecue is not in regular use. Now that you have the basics of cleaning the grill covered, you should now turn your attention to cleaning the internals of the barbecue. After several uses, there is a fair amount of gunk left at the bottom that hasn’t benefited particularly from being left outside in the elements. Over time, this build-up can become unhygienic as well as an additional chore for you to deal with. Charcoal grills suffer the most from this, and the best way to deal with it without spending a great deal of money is to first clean the inside of the barbecue properly by removing the hard and dry residue first using an old dustpan a brush (something all of us should have in the garage somewhere), and then removing the stuck-on dirt from the edges of the grill using general household cleaners. There are plenty of specific BBQ cleaners available, though these can cost two or three times as much as regular household cleaners. Feel free to give them a try, though from experience, regular cleaners perform the task adequately. Simply spray on a decent amount of the fluid and allow it to soak in properly for around 10 minutes, then gently scrape off the worst of the build-up with a plastic scraper. Once you have got this far you are ready to lay in the kitchen foil. Use a decent quality kitchen foil, the thicker the better, and triple layer it and turn in the edges so it looks like a tray. Place this into the bottom of your grill, and then add about a quarter-inch deep layer of sand into it. This will help to absorb the fat and excess juices that drain from the grill during cooking, and make your life MUCH easier in the long run. After several uses, simply remove the whole tray and discard it. Give the inside of the grill a quick brush and wipe, and insert another of your home-made foil trays to keep your BBQ clean for the next few uses. If you don’t mind spending a little extra money, you can use a catering foil tray and dispose of it after every few uses… just use common sense and get rid of it when it appears well past its best. Another tip you can try, is to pour leftover coffee on the grill. Clean off with a dry cloth. For a really good clean, spray the grill with your regular oven cleaner and leave it in a plastic garbage bag overnight. Hose it down the next day, and you should have a gleaming grill that is ready to use. You can also add vinegar or dish washing lotion to the water for additional cleaning power. Another well-used grill cleaning method is to simply rub the grill in the sand. This will remove most of the grease, etc. Once you have done this, hose down the grill. Depending on how caked the grill is, you may have to repeat this process 2 or 3 or times, but it is worth the effort. Gas taps often become hard to use during the colder months, causing plastic knobs to crack and in the worst cases, break. Remove the plastic knobs and spray the area with a light oil to loosen them. You can also try using a small amount of machine oil to each tap and then cover them with a light grease to prevent the oil from escaping. If one or more of your burners doesn’t produce a strong blue flame then it may be because a gas jet has become clogged. If you lift the burner out of the barbecue you will see small brass nozzles called venturis. These are like a small raised nut with a tiny hole through them. They can be simply removed with a small spanner. If you can’t clear the blockage, buy new nozzles ones from a specialist supplier. Insects tend to nest inside venturis when they are not in use, and the openings can become blocked. Use a venturi brush to clean the openings of the venturis. If you won’t be using your grill for a long time, consider using some venturi covers to prevent anything from getting inside. Reconnect the gas supply and check the connections by coating them with a 1:1 mix of dishwasher liquid and water. Any failings in the gas supply will be easily detected at this point and you will know that you will need to do something about repairing it. You can start off by tightening the connections or replacing the seals, and if this doesn’t work, then you should replace the faulty unit as per the manufacturers instructions or return it to your local service centre. Barbecues with wooden trolleys can be kept in fine fettle by re-oiling them once a year. All you have to do is give the trolley a gently sanding with some high grit paper and then use a suitable furniture oil or a specially formulated barbecue trolley oil. This will not only soak through oil stains on the top of your trolley but help prevent new stains from forming. Volcanic rocks need care too, if you use them. Ensure that you clean or renew them every year as they always become clogged with fat and oil. Remember to discard the old sand from the drip tray, clean the tray and give it a spray of cooking oil before lining it with aluminium foil. Place new washed sand on top of the foil to help keep it clean. If your volcanic rocks are showing signs of cracking, you can replace them you may consider replacing them with porcelain briquettes. These disc-shaped “rocks” are less porous than volcanic rocks and they are considerably easier to keep clean. If you live near the sea or in an area where the salt-air density is high, please note that will need to take extra time and precautions to ensure that your grill is not unduly subjected to the elements which will invariably lead to failing components and rust. Wash the outer surface periodically with fresh water and dry it off straight away for the best results. You can find more great barbecue tips, ideas and barbecue recipes at Barbecue Party.